TJ Brennan ripped home a game-winner with the minutes ticking down in overtime to seal the win for the Phantoms at the PPL Center. Looking snazzy in their orange PJs the Phantoms came out a bit snoozy in the first and went down 0-1. Some strong play by Carter Hart in net allowed the Hamilton Street Heroes to then grab the lead 2-1 in the second behind goals from Phil Varone and Misha Vorobyev. 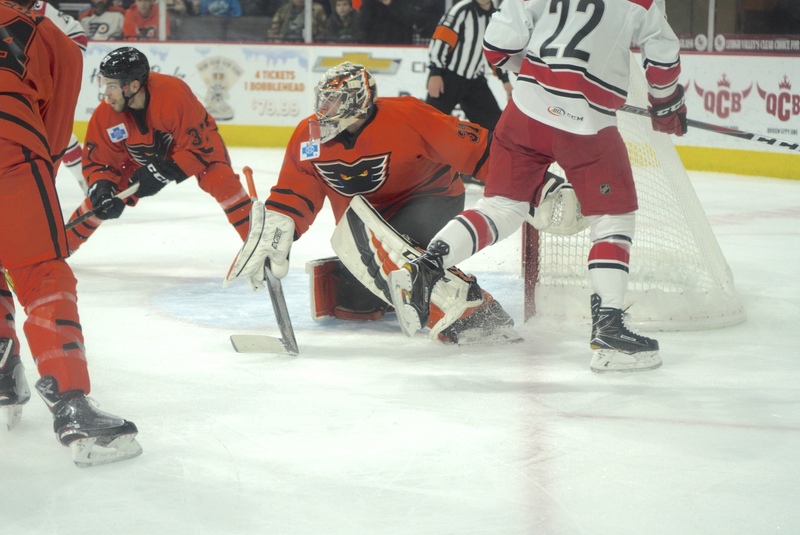 It didn’t stand up when a 5-on-3 and a penalty shot failed for the Phantoms to add some insurance, then Charlotte’s Julien Gauthier went low-glove on Carter to tie it. The Phantoms had the better of the play in the OT, cycling players efficiently and peppering the goal (area) with shots. Finally, TJ was able to end it after being fed by Misha. The three stars were TJ, Misha, and Varone. I think I’m having a “Hart Attack.” I made an angina joke in the pre-game, but really I thought Carter played a really nice game and despite a couple juicy rebounds he was able to cover the pucks better than I had seen him do it in the past. He also pushed a bunch to the corner and out of harm’s way. Overall, he saved 35 of 37 shots in the overtime contest. Lyon was the backup, and as some surmised in the pre-game discussion, Stolarz currently looks like “goalie non grata” around here. I have to wonder if his knees are 100%. I think It’s Hart To Pass Through A Defender. Man, we gave away a ton of pucks this evening trying to sneak it directly through the guys with the white jerseys on. Maybe that was the problem. Anyway, they seemed to get it fixed and we won so I won’t go on about it. I do have a lot of confidence in this team–even if they don’t look right or look lackadaisical, I kinda trust them to right the ship. I’m sure some nights we just won’t have it, but I’ll need to see all three periods to know that, huh? I think Mark Friedman had one of his better games tonight. It seemed to me he was all over the place making plays, moving the puck, and getting things towards the net tonight. Will Myers was good as well, but I thought Mark really stood out. I also think I want to see James deHaas have a bad game before I can endorse having his suit stapled to a chair in the press box. I think I’m going to miss Chris Conner when he’s gone. And it’s not just because he and I wear the same jersey size. He’s so pesty, sneaky and clever. He even got the “check of the game” tonight when a Checker underestimated him. He didn’t show up on the score sheet at all tonight, but easily could have been first star if a few of the chances he was involved with hadn’t been thwarted. Springfield falls from third place to fifth tonight as the Phantoms leap-frog into third, and the Penguins climb into fourth behind a goalie-goal from Tristan Jarry in a morning game earlier today. Bridgeport continues their strong play and sits in second. Charlotte has three points on Bridgeport and five on the Phantoms as they head to the Mohegan Sun for back-to-back games Friday and Saturday. 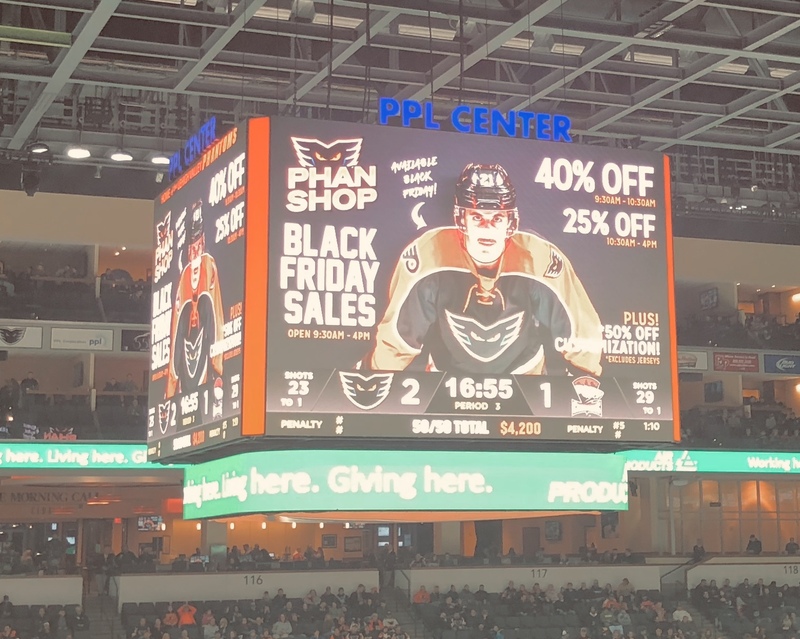 The Phantoms will face a dangerous Providence team on Friday, who probably don’t deserve to be in last place, and then a reeling Springfield side on Saturday in an away-weekend in New England. The Winner! Photo: Jack Mitroka. Special thanks to Russ Hryvnak for facilitating our credentials for the evening. Cole Bardreau emerged almost midway throu with his second breakaway of the game and this time was hooked by Charlotte defenseman Trevor Carrick. But Bardreau was unsuccessful in his first career penalty shot as Nedeljkovic denied Bardreau’s backhand offer with a right-pad save. 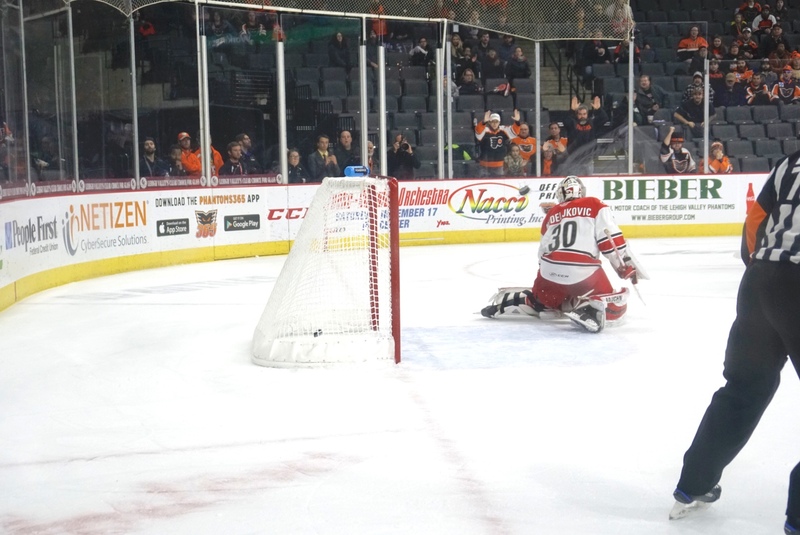 It was the first penalty shot of the season for the Phantoms and the first for the team in over a year since Danick Martel was had one on October 14, 2017 against Wilkes-Barre.